I was trying to think of a plant where we eat the stems on purpose last night, but really nothing comes to mind. Yet, stems are a sign of sign of freshness -- and based on what I've seen in the grocery store, people are willing to pay a premium for stem-on produce. 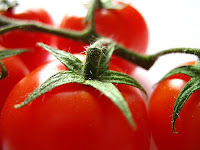 If you don't believe me, check out the stem-on tomatoes next time you go to the store -- they don't taste any better than the ones without stems and you just end up throwing the stems away (or composting). So, what's the appeal? I personally like a long, twisty stem on my pumpkins. Just check out the marzipan stems on these pumpkin cakes I found on CountryLiving.com! But back when I made the prototype, that idea didn't end up so great! So, the consensus was to make the pumpkin #1 pattern with a shorter stem. Well, enough talking about stems, let's get to the good stuff! 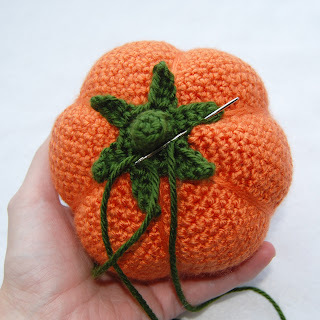 You'll start your stem the same way you started the pumpkin -- use either the magic ring or you can start by chaining two and then adding six single crochet stitches to make a circle. For the next round, you're going to work in the outside loops. This gives your stem the appearance that it has been cut off the vine -- with a well-defined top and sides. 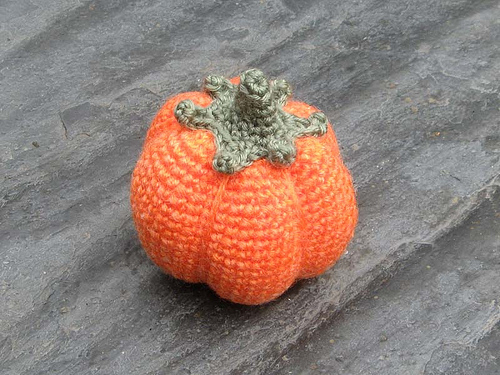 This picture from AmigurumiCat's pumpkin gives a great perspective of how working in the outside loops gives the stem a defined top and sides. 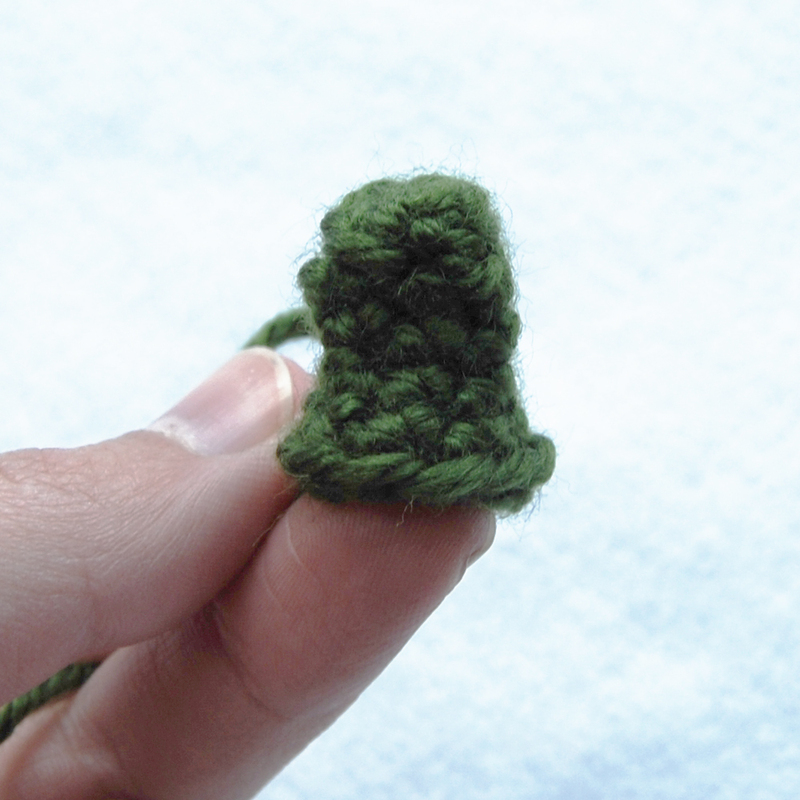 Next, you'll work a round of just single crochet in order to build the length. And then, start making those rounds larger, and larger. My pattern gets you out to a 12-single-crochet round, but if you chose to grow your pumpkin larger, you might want to go out to 18 or even 24 stitches in your round. Remember though -- if you do make your stem larger, this is going to affect how you add the little "leaves" that connect to the pumpkin! One option (as I did on the smaller pumpkin) is to leave the leaves off entirely. LOL... "Leave the leaves off." I kill me. 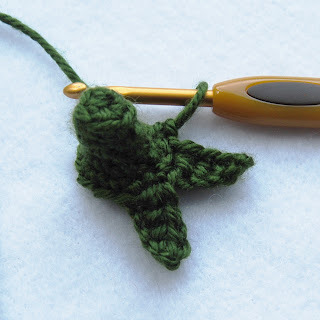 You could also try chaining a few extra stitches and working up to a double crochet or or even a triple to make the leaves wider. If you do go this route, I'd love to see how your leaves turn out! Last but not least, we'll talk about the little curly vine bit that goes with the stem. Crochet naturally has a tendency to curl up on itself when you're only making one row, so we use that to our advantage on the vine. 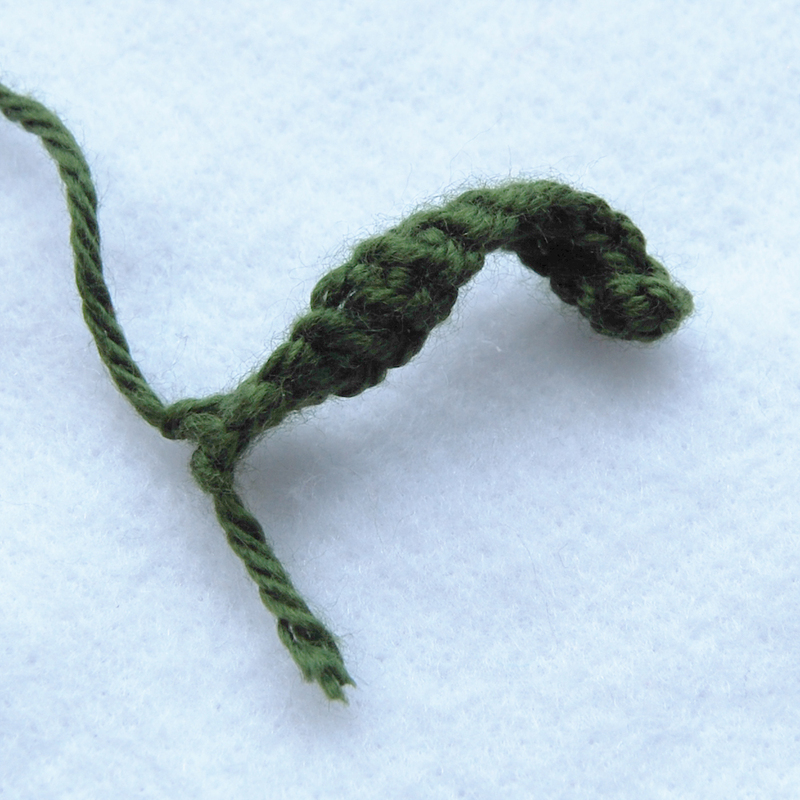 All you need to do is chain your way out and then single crochet your way back. If you want even more curl to your vine, add a single crochet here and there along the way, so that there are more single crochet stitches than there were chain stitches. 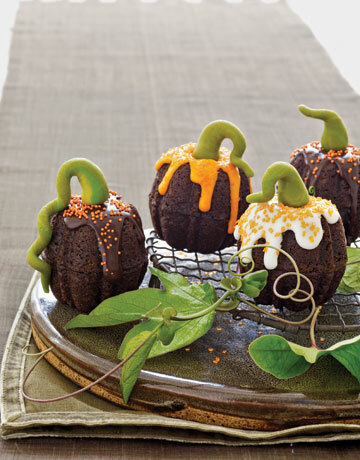 Slide on in to the home stretch by sewing the finished stem and vine piece to your pumpkin and ta-da! You're done! Hey, I noticed a slight typo on your pattern while working the stem. On round 6, it says the stitch count is still 10 sc instead of 12.